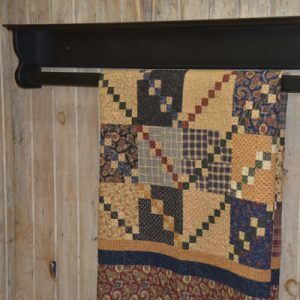 The Hanging Quilt Shelf is ideal for hanging quilts that have a rod pocket attached. The quilt can also be draped over the rod for storage. The rod is removable from either end. A rod cover is attached so the rod cannot slide out unless the cover is moved out of the way. The Hanging Quilt Shelf has a shelf attached to the top of the end brackets. The shelf is 3 1/2″ or 5″ deep and is 4″ longer than the size purchased for the quilt. Screw covers are supplied to cover the mounting holes.See first pricing chart for 80XX and second chart for 85XX. 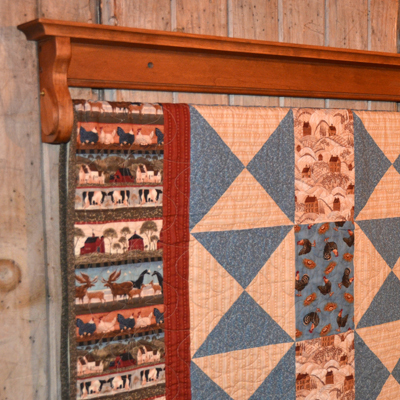 The 96″ Quilt hanger can be ordered but not shipped due to high shipping costs. Pickup at a quilt show or at DWR Custom Woodworking is available.